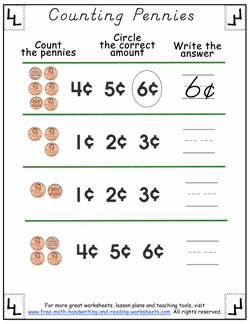 These counting pennies worksheets are an excellent way to ease your child into learning how to count money. When children learn how to count numbers they start with single digits and work up--money should be the same way. 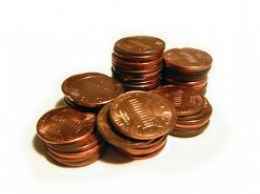 Pennies are a great resource for learning how to count. Kids love to have their own money (no matter how small) and counting pennies is one way to get them excited about learning. 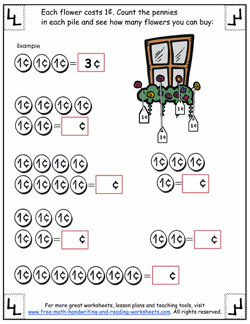 You will find four coin counting worksheets below. Clicking on a picture will open up a printable PDF in another tab. From there you can print or download your sheet. Each paper has basic instructions on it. I'll cover them in more depth further down. You can also find lessons covering nickels, dimes, quarters, and dollars using the 'Money' link below. The first worksheet has six boxes with pennies inside them. Your child needs to count the pennies and then write the number on the line below. You can make it a bit more fun by coloring in the pigs as well. The next paper is similar except it uses a 1 with the cent symbol instead of actual pennies. 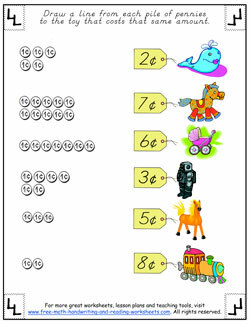 Again, have your child count the 'coins' and write the number on the line provided. The third printable switches back to pennies. Your child will count them and then circle the correct answer, then write the change on the line. Then there is a worksheet with, believe it or not, more counting! 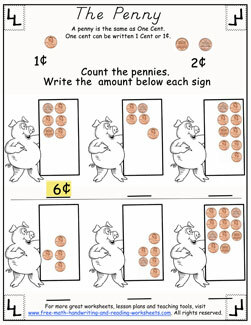 Same basic idea except after counting each row of pennies, the student needs to draw a line from the pennies to the object that could be bought.